What a wonderful idea this is. So much so I dropped everything I was doing including my now one-month-old son; in his crib of course, and told him that for the next few hours he had better fend for himself. Of course what I really meant was, that he is taking a nap and this is the only time I have while being held hostage by his will and schedule. Believe me when I say this was put together at a feverish pace. First, thank you Lu Ann; of The Cup of Life, for “tagging” me. After which I so desperately just wanted to say… “Ha-Ha you can’t catch me.” I just couldn’t help myself. Defiance, not to put to blunt a point on it. For all of my life all members of my family drank tea. However, for those who know me I come from an Indian family and as I am sure you can assume my family is big into Chai. I on the other hand was not a big fan of all the sugar and milk. The spices were wonderful but still the way it was prepared wasn’t my favorite. So I decided to venture out of the chai world and explore different teas in an out right defiance of what my family was drinking. It was there my love and affinity for tea was born. Funny story, I don’t mind the version my family makes now though I still don’t drink it. I do enjoy other chai’s now and I make my own version with milk and sugar but am very cautious of how much I use. Honestly, I haven’t got a clue but my guess is Lipton as it is a vivid memory in my mind as a child. My family often used Lipton tea bags as a quick an easy base to make their everyday chai. However, this is no longer the case and hasn’t been for a long time. They now strictly use a loose leaf tea blend. I am not 100% certain but I believe I started my blog roughly 4 years ago and I think I am approaching 5 years early to mid-next year. I can’t believe it has been that long. I started my blog as a way to keep track of what I was drinking. Then it became more. It was a great venue to be able to express not only what tea I was drinking but where I was when I was drinking it, how it made me feel, and what I was doing. Not a day goes by that I don’t have a tea in hand, which in turn means so many wonderful memories to remember each of which I can review in my catalog of blog posts. My blog continues to evolve organically and is an excellent representation of my thoughts and me. I can’t image a better way to express myself and love the feedback from those who read them. The most rewarding thing about my blog is the number of people I have met and the friendships I have been able to foster. I can’t believe the doors it has opened. I never thought my ramblings were so interesting to so many. As for discouraging, if I really had to think of one thing I would say staying on a schedule and remaining engaging to my readers consistently. Most likely a black tea as I am no fuss kind of girl when I need tea and don’t want to spend a lot of time making it and worrying about steep parameters, measurements, and such. Black tea can be so forgiving which I find a desirable trait especially these days. Specifically, I have been drinking a lot of my blend, Winter Frost from iHeartTeas. It absolutely puts me in the holiday spirit, which just happens to be my favorite time of year. As for cold tea I will ALWAYS have a bottle of Ito En’s Oi Ocha Dark within arms reach no matter where I am. I love it and it is my green tea fix when I don’t take the time to make it at home. 6) Favorite tea latte to indulge in? Tough question, I have been experimenting a lot of different recipes using various different teas for the past couple of years now and each offers a type of satisfaction for whatever mood I may have been in at the time. 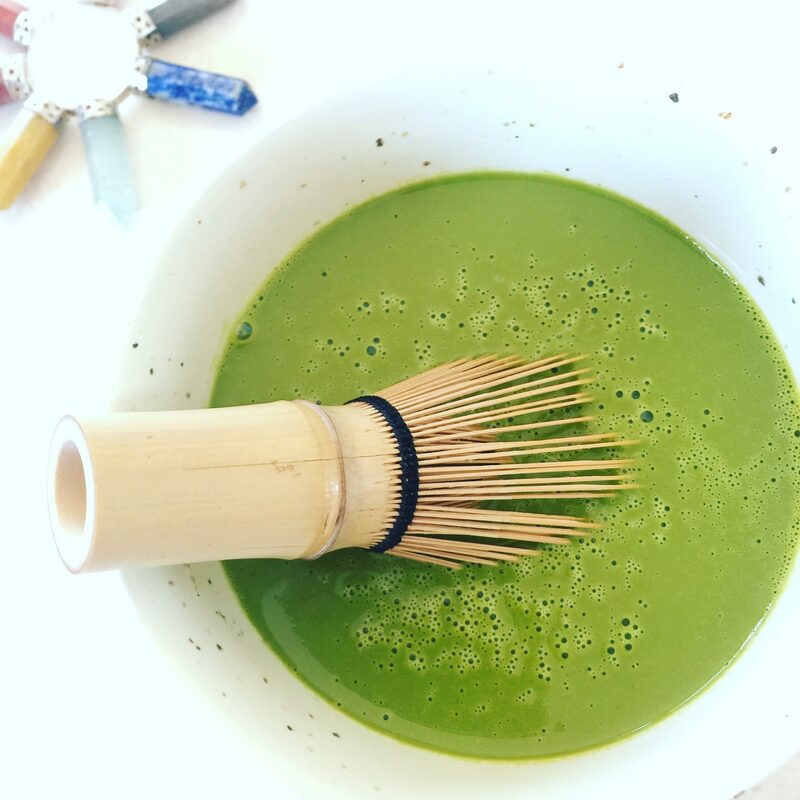 However, at this moment I am going to say a Matcha Latte and only because I didn’t feel comfortable having Matcha while I was pregnant and now that I am not I have started to slowly introducing it back into my diet. Yummy! 7) Favorite treat to pair with your tea? I don’t often pair anything with my tea. However, when I do I reach for some macrons, scones with clotted cream, and cookies. Not all at once of course. Also, turns out I like a good, bold, brisk, black tea with pizza too. I would love to visit Japan. I am fascinated with the culture and flavors of the country. 9) Any teatime rituals you have that you’d like to share? I don’t have any rituals per say unless, it is a ritual to drink tea all the time with everything. That and my husband as of late has been preparing tea for us every night before bed. Anytime – ALL THE TIME!!! I wish people to have the opportunity to try some really good teas for their flavor and not get so caught up in any supposed health benefits or weight loss claims. — Who do you tag? *Side Note: When you create your own tag post, please start by letting your readers know who you were initially tagged by. Feel free to use the photo above as well. Double tag for me… Under pressure, under pressure. I love reading your answers, and seeing everyone inspired by these tags. But – uhm, you didn’t mean me, did you? Well, I guess you did. The thing is, I wrote a long post in reply and then – you would not believe what happened!! Just as I was going to hit “publish” a dog (a giant wild one about 7 ft tall) ran past me and jumped onto the desk and ate the entire laptop. It was horrible. All I could save, was myself. I’m so sorry this happened, but well, hopefully you’ll understand. LOL 🙂 Aww that is too bad. Just one question @jackie. If the dog ate the laptop how were you able to respond?